You asked for it so here it is!! This follow on workshop to A Beginners Guide To Canine Massage and K9 Massage For Agility & Sport is the ideal way to develop the skills you have already learned and add a some exciting new techniques to your Massage-At-Home-ToolBox. Due to teaching time constraints this course only runs once a year so book early to avoid disappointment! Please note this workshop is designed for past attendees of the Beginners Guide or Agility & Sport 1 Day workshop. The Beginners/Agility workshop may of been taken with either Canine Massage Therapy Centre or one of their Licenced Practitioners. 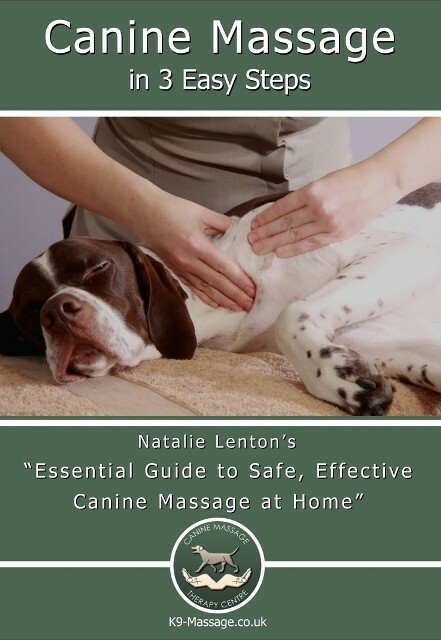 FREE Palpation and Report For Your Dog – Let Your Dog Enjoy An Assessment With Natalie And Find out about areas of pain, injury and soreness that may explain `inexplicable` lameness, reluctance to do things they once did, ageing overnight and slowing down etc.. so you know where to concentrate your new massage skills when you get home! 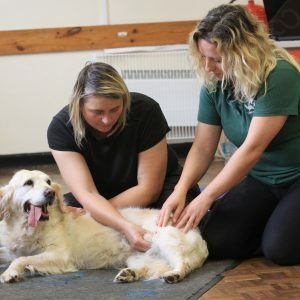 If you and your dog enjoyed and benefited from the first workshop then this Intermediate Canine Massage workshop will really help you to develop your own skills so you can become your dogs very own therapist at home! This Course is for Home use on your own dogs only. PLEASE NOTE THAT THERE WILL BE AN ADMIN FEE SHOULD YOU NEED TO TRANSFER OR CANCEL YOUR WORKSHOP BOOKING. See our Terms and Conditions for further details.